Indiana State University is easing the shortage of middle school math teachers with a new degree program approved by the Board of Trustees Friday. With a national focus on science, technology, engineering and math (STEM) education, there is a shortage of math teachers in Indiana -- and beyond. Currently, Indiana State offers a mathematics teaching major (82 credits), which leads to licensure for grades five through 12, and the elementary education major coupled with the middle school mathematics minor (101 credits minimum). 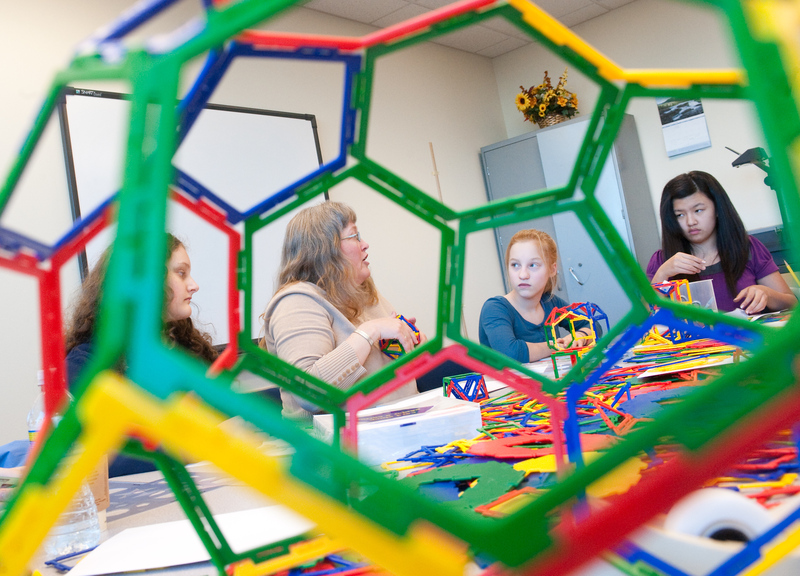 The new middle school mathematics major will have 69 credit hours. "There are a substantial number of students who want to teach middle school math, and this will give them a shorter pathway to get there," said Liz Brown, professor and chair of the math and computer science department. The new major will also better prepare these future educators to navigate the unique developmental stage of middle school students (grades five through eight), Brown added. Because the program draws mostly on existing curriculum in the math minor, no new faculty will be added. "We've already seen our minor working," Brown said. The middle school math major is effective fall 2018. • President Deborah Curtis asked for a moment of silence for fallen Terre Haute Police Department Officer Rob Pitts, who was laid to rest Wednesday after being killed in the line of duty on May 4. • Approved operating budgets for the 2018-19 fiscal year. Overall projected revenue and expenses for Indiana State's 2018-19 General Fund budget is $195.3 million. Tuition (55.1 percent) and state support (40.7 percent) make up the majority of Indiana State's projected revenue. The remaining 4.2 percent is other fees and charges, miscellaneous income and transfers. The new budget contains a 1.8 percent increase pool for salary adjustments, including a 1.5 percent across-the-board increase for employees with good performance and faculty and staff target salary programs. Criteria for any salary adjustments will be determined once enrollment numbers are known for the fall 2018 semester and overall budgetary conditions are assessed. The budget also reflects a 1.5 percent increase in student wages and a 2 percent increase in student scholarships. • Approved a resolution naming the football practice field the Jack and Joyce Rentschler Football Practice Field at Memorial Stadium, subject to execution of a final gift agreement with the ISU Foundation. The Rentschlers met while attending Indiana State Teachers College in the 1950s. • Approved splitting the current bachelor's in human and environmental systems into two majors - a bachelor's in geography and sustainability and a bachelor's in anthropology. The change will streamline the two majors and better delineate the unique identities within the majors and the faculty. • Approved splitting the current bachelor's in earth and environmental systems into two majors - a bachelor's in environmental geoscience and a bachelor's in geology. This change will allow the option for a student to double major or move between the two majors. • Approved a merchandising minor and a design minor for textiles, apparel and merchandising (TAM) majors. The merchandising minor provides students with the opportunity to explore the business aspects of the fashion industry and learn about the dynamic processes of developing and marketing fashion goods, distribution channels, sourcing strategies and retail operations. The design minor provides students with the opportunity to explore their creative interest, specific to the fashion industry, and learn about the dynamic processes of constructing clothing, including textile design, pattern-making techniques, garment fit, pattern manipulation, fabric draping techniques for garment construction, and planning and implementing strategies necessary for securing design-related career positions. • Approved a new financial services selling minor, which was designed based on the input from the Sales Advisory council and replaces the medical sales certificate program. The new minor will combine interpersonal and communication skills (sales courses) with analytical and empirical skills (financial services courses) gives students a unique skill set that will give them a competitive advantage in the hiring process. • Approved changes to Policy 630 Purchasing Policy that incorporate new procurement standards for federal awards as required by the Office of Management and Budget (OMB) in guidance titled "Uniform Administrative Requirements, Cost Principles, and Audit Requirements for Federal Awards," effective July 1. • Approved a modification to University Handbook Policy 932 Data Security Policy, which will be renamed Policy 932 Data Security and Management, to ensure Indiana State manages data and data security in accordance with best practices. • Approved modifications to the following policies: Policy 922.4 (Appeal Process for Sexual Misconduct Determinations Involving Students), policy 270.1 (President's Council on Inclusive Excellence), and policies 305.17 and 305.15.6.1 (promotion and tenure). The board of trustees will hold its annual retreat Aug. 16-17. With the shortage of qualified mathematics teachers in Indiana and the nation, a new middle school math teaching major provides a more direct route to licensure for those who wish to focus on this grade level.